Sunlight bleaches the exterior bricks on your home from their original color over several years. Brick stain kits are available at home improvement stores in a large variety of colors. You can use these kits to restore the bricks to their original color or change their color to a darker one altogether. 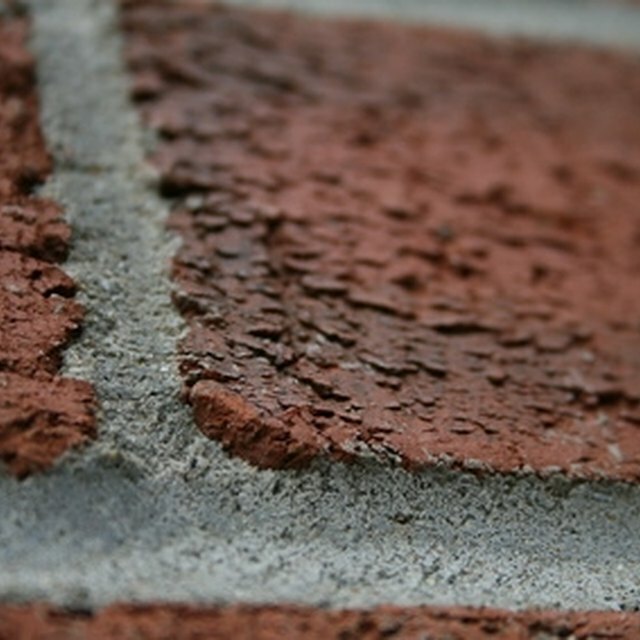 A brick stain kit can darken the exterior of your home. Clean the brick with a power washer to remove any loose soil or dirt. Turn the tip of the application wand to a flat spray pattern and step back at least 3 feet from the bricks while spraying them. Let the bricks dry completely. Mix the brick stain according to the package directions. Brick stain kits usually include gloves, a liquid additive and a powder coloring agent to which you apply water. Stir the contents thoroughly. Dip a paintbrush into the stain mixture. Paint a small area of brick in an inconspicuous test area. Let the stain dry and observe the color. To lighten the stain, add more water. To darken, add a second coat or select a darker stain. Be aware of the extra cost, however. Paint each brick individually with the paintbrush, taking care not to paint the mortar in between each brick. Wipe any drips up immediately with a wet shop towel. You may use a garden sprayer to spray stain the bricks if you choose to darken the mortar also. Mask off doors and windows with painter's tape and plastic sheeting to protect them from overspray.